Please call us at 850-370-1000 if you don't see the appointment type or availability you are looking for. Dr. Ryan Pharr graduated from the University of Health Sciences College of Osteopathic Medicine in Kansas City, Missouri. He completed his internship and residency training in family medicine at Capital Region Medical Center in Jefferson City, Missouri, where he was named Chief Resident. Dr. Pharr ... Read More is a member of the American Osteopathic Association and the American College of Osteopathic Family Physicians, to which he has been a state delegate to the national convention. Dr. Pharr has a passion for using his talents to help others. He has done medical mission work in Haiti, and as a PRIMO Scholar, he worked for five years with the Missouri Department of Health and Senior Services to provide health care to those in need. Prior to joining Sacred Heart Medical Group, Dr. Pharr practiced family and emergency medicine for eight years at Salem Memorial District Hospital in Salem, Missouri, where he was Vice Chief of Staff and later Chief of Staff. 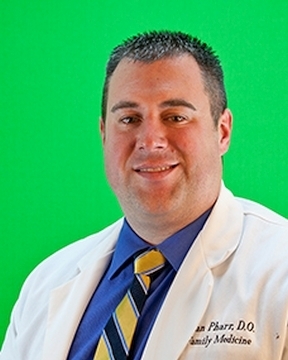 Dr. Pharr enjoys spending time with his wife and three children, who love outdoor activities, games and family walks.